Marketing that embodies a brand promise, rather than just communicating it, is always a delight. 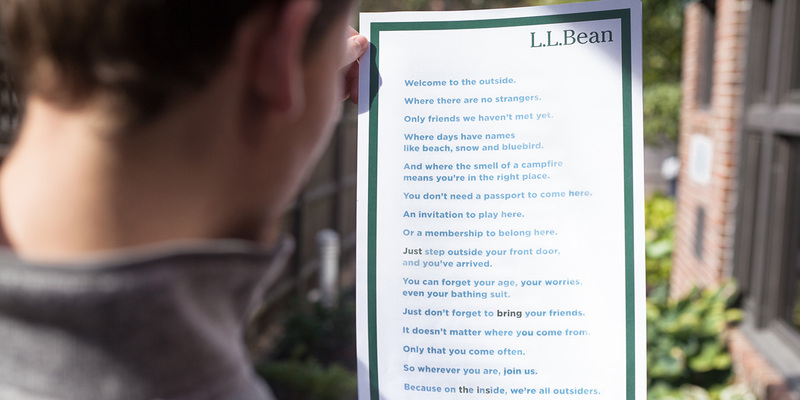 L.L.Bean gives us the latest example of this, with the outdoorsy retailer publishing a full-page newspaper ad you can only read outdoors. The brand’s new tagline, “Be an Outsider,” appears in large lettering below, along with an additional entreaty: “No, seriously. 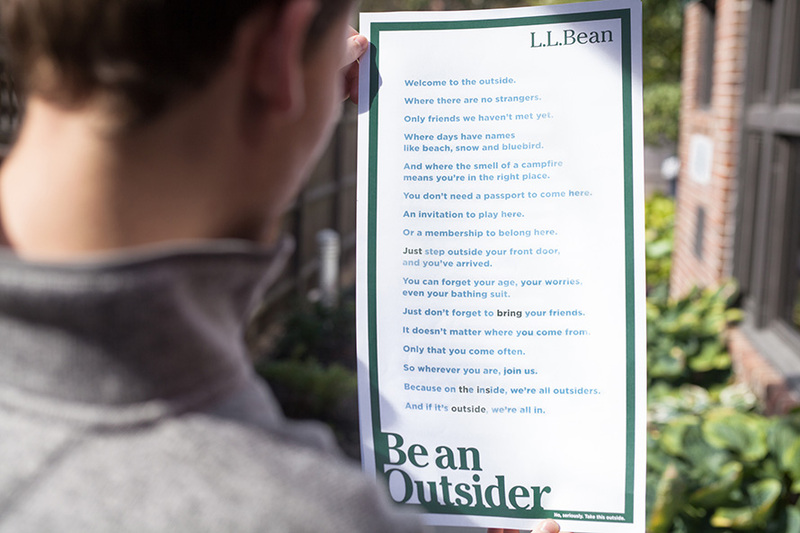 Take this outside.” Readers who do just that will see the page come to life, with more text filling in the blank spaces, eventually revealing a whole “Be an Outsider” manifesto. The ad was made with something called photochromic ink, which is colorless indoors but turns different colors when exposed to ultraviolet light, usually from the sun or a black light. VIA partnered with CTI Inks in Colorado to bring the idea to life. 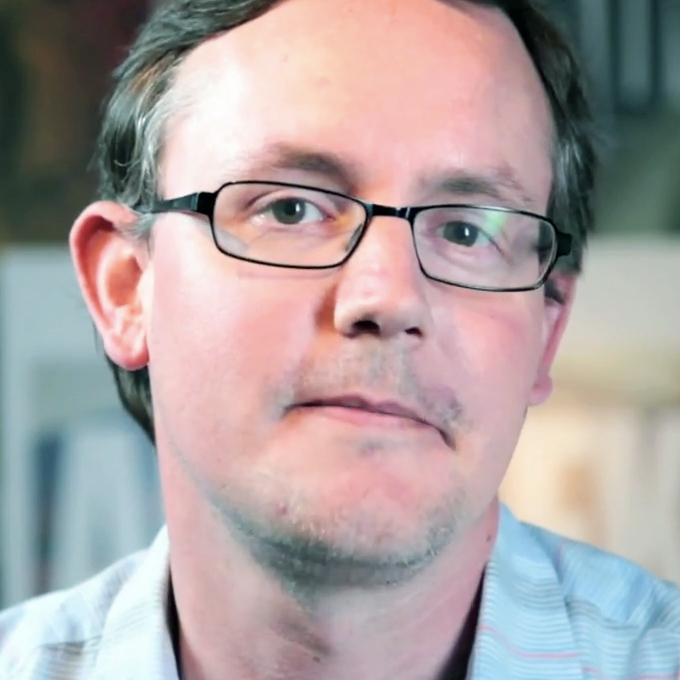 Teddy Stoecklein, executive creative director at VIA, said the agency had written the manifesto and was looking for a creative way to present it to the world. Where there are no strangers. Only friends you haven’t met yet. like beach, snow, and bluebird. means you’re in the right place. You don’t need a passport to come here. An invitation to play here. Or a membership to belong here. 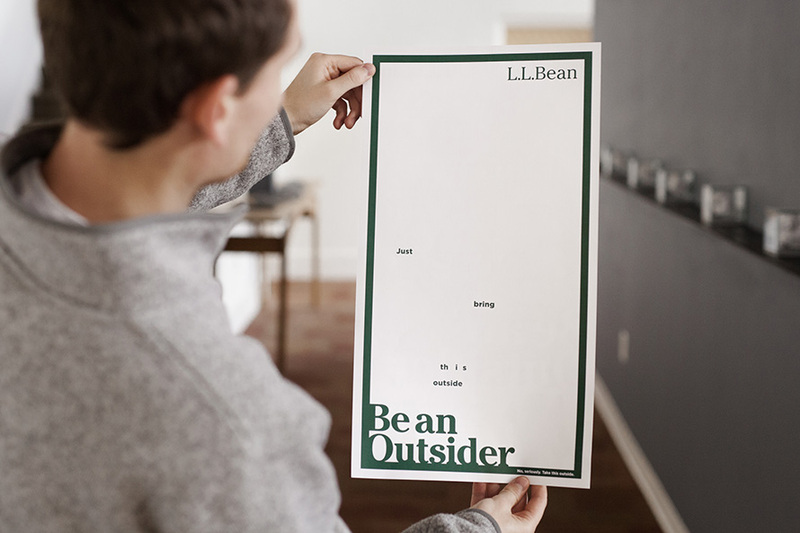 VIA won the L.L.Bean account in March after a review, bringing together Maine’s largest ad agency and its largest retailer. VIA broke its first “Be an Outsider” ads for the brand in July. The use of photochromic ink is a clever one for an outdoorsy brand, though it’s hardly the first use of the technology in marketing. An Austrian solar company won the Design Grand Prix at Cannes Lions in 2012 for printing its annual report in photochromic ink—the text and graphics could be seen only in sunlight. That followed a solar-powered print ad the year before from an Israeli energy company. Just this year, Coors Light—that shameless innovator of packaging technology—used photochromic ink on cans in Canada to reveal colorful patterns when you take the beer outside. See some of VIA’s recent TV work for L.L.Bean below.